There are many advantages in using video as part of your KM program. Here are some of the plusses and minuses. The use of video can make a big difference to the effectiveness of knowledge transfer. 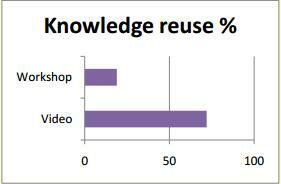 This story, for example, about transferring knowledge of “how to parboil rice” to women farmers in West Africa, shows that the reuse of the knowledge transferred by video was much higher than knowledge trnasferred by workshop (72% as opposed to 19% - see the graph). But what are the advantages, and what are the disadvantages of video use? The knowledge can be transferred by people with a shared context. The people telling the story in the video mentioned above were women rice farmers from Africa, not western scientists. This delivered a level of trust in the knowledge, as it was being demonstrated by peers. People retain more by watching than by reading. There is an Internet meme that says you retain 30% of what you see compared to 10% of what you read. This has been challenged, but there may be some truth in it. You can show things in video that are difficult to describe in writing. When we are conducting Knowledge Retention, or Knowledge Harvesting, exercises, we take a video camera and often will say to the interviewee, “show me”. The resulting video can often be more useful than a page full of words. As an example, this website is full of instructional video on topics such as how to tie a Windsor tie. You try explaining this in words! You can tell stories. A good story, told well, by a number of people who were really involved in the event, can convey authenticity and emotion. The video can either transfer the knowledge (if it is simple knowledge), or it can act as an advertisement for a more detailed Knowledge Asset. Generally the stories need to be short to hold the interest, especially if only one person is telling the story. 3 minute is about the maximum time you can expect people to concentrate on one “talking head”. Better to mix and match, and tell the story “in many voices”. You can add the emotion and emphasis. Video contains emotional content and inflection that is lost in text, and provides body language that adds conviction. We use it in our presentations and in our knowledge assets, and on our website. Video can be difficult to capture. If you want high quality video with clear sound, you need good and expensive equipment. On the other hand, if you can manage with lower quality, use a smartphone. With smartphones, everyone has a video camera in their pocket. Video is more difficult to present. It's easy to present text and images to people. You email it, you put it on a website, or you print it out. Video is less forgiving - it needs to be provided through a screen. But again - with smartphones, everyone has a screen in their pocket. Video is more difficult to search. Text can be searched, video can't. It therefore needs better tagging, and better metadata, in order to make it searchable and findable. Video takes more bandwidth. Where connectivity is poor, video may be a luxury you can't afford. So video has its uses, and it has its problems as well. Use it wisely, and it has the capability to really enhance your knowledge transfer. In the knowledge transfer discussion reference to Gabriel Szulanski (issues of knowledge stickiness) and Kolbs learning styles are relevant. In particular I summarise this as ensuring that the transferer (sender) and receiver need to be on the preferred learning channel of the receiver. Most folk have a preferred learning style (Visual, Audio, Kinesthetic) in order to best assimilate information. Most folk can also receive all three, but a small percentage can only really receive via a single mode. The best use of video will always be most effective for those that prefer to watch to learn or absorb material. In my opinion there will always need to be a mix of modes to accommodate all learning styles. Add into this transfer situation the Szulanski theories relating to receivers choosing whether to or not to receive information based on the credibility of the sender and it is easy to see that this isn't just a discussion about media. Just for the sake of balance, it is worth saying that there is a lot of challenge nowadays to the theories of learning styles (see the criticism section of the Wikipedia entry - https://en.wikipedia.org/wiki/Learning_styles). I personally have no strong views one way or the other.